The Kurata mobile mech suit is up for sale at Amazon.jp for a whopping ￥120,000,000 (roughly $1,000,000) for any budding pilot brave enough, or bored enough, to procure. 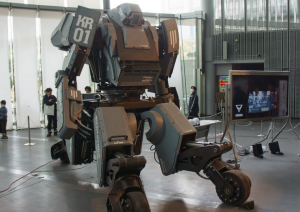 The seemingly unreal vehicle/robot hybrid was developed by artist Kogoro Kurata (after whom it is named) and roboticist Wataru Yoshizaki, and built by the Japanese company Suidobashi Heavy Industry; it’s the real deal. 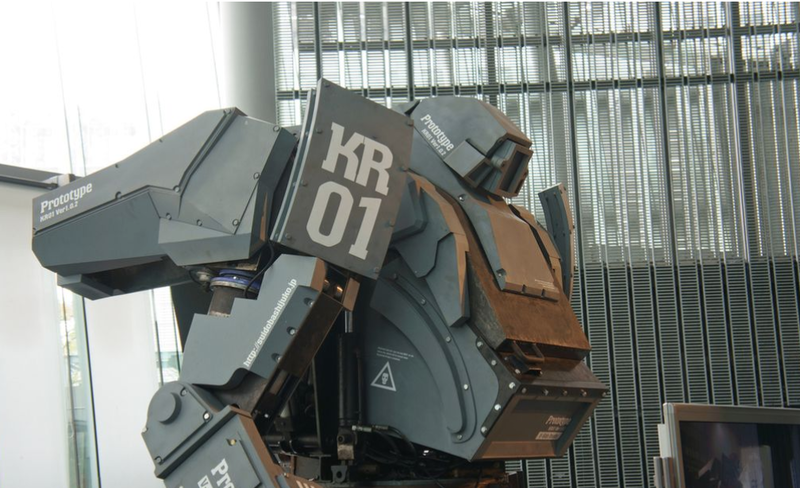 Frustrated with the lack of giant robots being developed in Japan (naturally), Kogoro Kurata set out to build his own by seeking to emulate the mechs that he watched in anime growing up. “When I was a kid, I thought there were going to be giant robots in the future. But no matter how long I waited, people were only able to make small robots, like Asimo. Eventually, I thought ‘I can’t wait anymore,’ and set out to make one myself.” More specifically, Kogoro’s primary inspiration was taken from the series Armored Tropper Votoms. 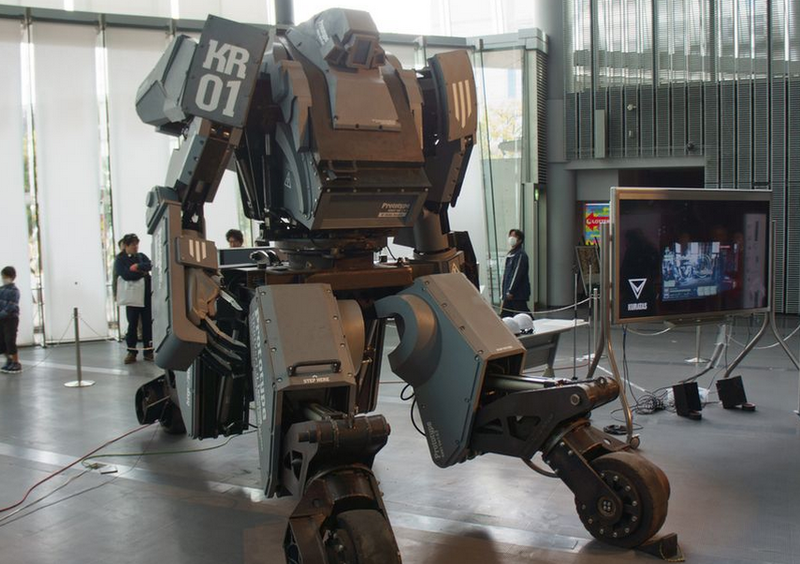 four meter tall, 4,500 kg (4 tons) vehicle/robot that’s able to drive at up to 10 km/h (6.2 mph), and freely move its legs, torso, and weapon-equipped arms using 30 hydraulic joints. The robot may be manually piloted from a control panel situated within its cockpit or remotely via specialized controller or smartphone app. Contrary to what we hoped, Kurata is not bi-pedal or even capable of walking; instead, it glides on four wheel-tipped. 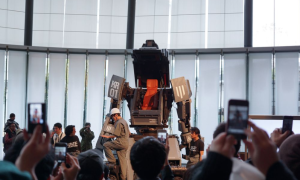 The entire concept is essentially a love letter to mecha, featuring a high level of detail designed to give users the most immersive experience possible. For instance, the hatch covering the cockpit swings upward in a smooth and steady manner, mimicking the hydraulic-powered doorway characteristic of most mechs featured in anime. Once inside, pilots are greeted with a futuristic-looking control panel equipped a touch-screen user interface and Microsoft Kinect-based visual input. But while the machine looks militaristic in nature, and certainly sounds militaristic in nature, its “weapons” are little more than special effects…to an extent. So far, Kurata is equipped with a “LOHAS” launcher that fires either water bottles or fireworks, twin BB Gatling “cannons” that fire 6,000 rounds per minute (it’s not clear whether the BBs are metal or plastic), and a powered humanoid hand called the “iron crow.” This last bit is supposedly linked to pilot through something resembling a Nintendo Power Glove, the strange glove-like peripheral released for the Nintendo Entertainment System.